The St. Patrick's Cemetery Association — a part of St. Patrick's Church Corporation Collinsville Connecticut — operates three cemeteries, two in the Collinsville section of Canton and one in Burlington. To see a price list, a copy of the cemetery rules and regulations, or to contact the Cemetery Manager, see the links in the sidebar on the right-hand side of the page. Calvary Cemetery sits at the end of Collins Road in Collinsville overlooking the Farmington River on the site of the Sam Collin's mansion that burned down on January 30, 1912. It has three sections surrounded by old growth trees: Upper Calvary, Lower Calvary, and the Field. 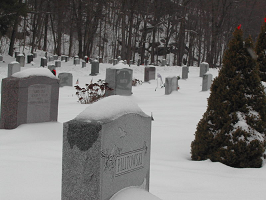 Upper Calvary is unavailable for burial rights purchases; it is sold out. Lower Calvary and the Field, however, have graves and plots available for the purchase of burial rights. St. Patrick's Cemetery Burlington is a section within the Town of Burlington Cemetery on Route 4. The cemetery entrance is next to the Town of Burlington Public Library on Library Lane in between the library and the baseball field. Burial rights for families or individuals are available for sale. St. Patrick's Cemetery on Huckleberry Hill is located adjacent to the Village Cemetery on Cemetery Road in Collinsville. This overlooks the Farmington River from its perch several hundred feet above the water. Burial rights purchases are no longer available; the cemetery is sold out.